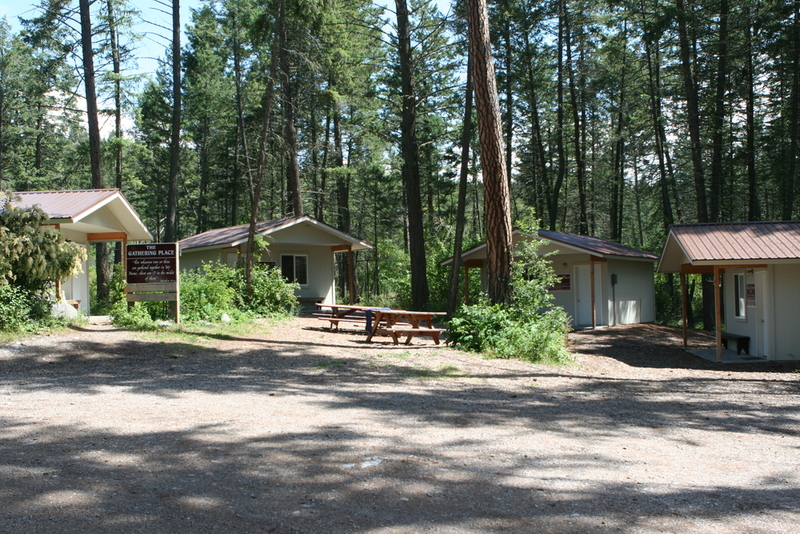 Camp Trinity, just south of Bigfork, off of Highway 35, is a beautiful setting for your next retreat or family reunion! Camp Trinity has 40 acres of woods and 2,000 feet of waterfront on Flathead Lake, the largest natural freshwater lake in the west. Guests enjoy canoeing, kayaking, swimming, ‘high’ diving, hiking, evening campfires, and spectacular mountain, sunset views from the lakefront area. Camp Trinity is owned and operated by Trinity Lutheran Church in Kalispell, but it is not just for Lutherans. Everyone is welcome at Camp Trinity where you can find new friends, grow in faith, and make memories that last a lifetime! Can we cook our own meals? - You may cook your own meals or leave the cooking to us. We also have many good restaurants 2-3 miles from camp in Bigfork. We have a large commercial kitchen in our (1,350 s.f.) Main Dining Hall that is available mid-May to mid-October and we also have a smaller kitchen in our year-round Chalet. What meeting spaces are available? - The largest indoor meeting space is our Dining Hall (1,350 square feet). Groups can also use the camp’s recently updated multi-purpose Chapel (1,200 square feet) which has brand new wood-stove heating and a new built-in projector, screen and sound system. The Chalet has been completely renovated for year-round use. It has a kitchen, restrooms, dining area for 45 people and a rec room in the basement with couches, ping pong table and a fireplace. Do you have boats we can use? - You may use our non-motorized boats (canoes, kayaks, etc), paddles & life jackets at no extra charge. There are also rental places 2-3 miles from camp for other options. How many people can stay at your camp? - We can house over 120 guests in 16 (heated) cabins that typically sleep 8 people on 4 bunks. Some cabins also have one double or queen bed. We also have RV hook-ups and a nice meadow for tents. Can we have the whole camp to ourselves? - If your group can guarantee 50 guests, then you can request exclusive use of the whole camp (not counting summer staff or camp cooks). Where are the bathrooms? - The cabins do not have bathrooms, but most bathroom facilities and showers are 25-100 steps away. A few private staff rooms have adjacent restrooms, but these are only rented out for guests with special needs. Do you provide bedding and towels? - We can provide a quilt, sheets & towel set for each person who needs one for an additional charge. Prices are on the reservation forms below. What is the closest airport or train station? - The camp is 35 minutes from the airport and 45 minutes from the train station. The nearest airport is Glacier International Airport (FCA) in Kalispell. There are direct flights from Chicago and Minneapolis/St Paul, MN and many other cities, especially June-September. Taking the train to Whitefish, MT is a very scenic and less expensive option. Driving through Montana is scenic and fun, especially if you like to drive fast. The speed limit on the interstate is 80 MPH. What else can we do in the area? - The surrounding area offers plenty of opportunities for outdoor recreation and sight-seeing. Glacier National Park, known for its history, wildlife, hiking and scenic beauty, is less than an hour’s drive from the camp. Jewel Basin is a shorter drive and the hiking there provides breath-taking views of the Flathead Valley and the Rocky Mountains. Bigfork, Montana, just 5 minutes from Camp Trinity, is a charming western artisan village on the bay with a wide assortment of fine art galleries, restaurants and unique shops. What is the cost? - The dude ranch down the road from us is on the same lake and has the same views as us, but charges $5,000 per person per week. Our prices are much, much more cost effective than that. Our prices are listed on the reservation form you may download below. Be sure to choose the correct year your event will take place. The prices listed are per day/per person, unless otherwise noted. Back Lower deck of dining hall.